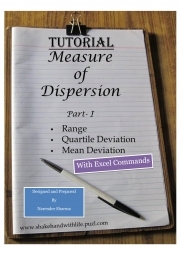 Description of "Range, Qaurtile deviation and Mean Deviation (eBook)"
This tutorial is detailed explanation of Measure of Dispersion like Range, Interquartile Deviation, Quartile Deviation, Mean Deviation with their excel commands. Measures of dispersion is used for analysis of variation in data. It is the important part of descriptive statistics. Reviews of "Range, Qaurtile deviation and Mean Deviation (eBook)"